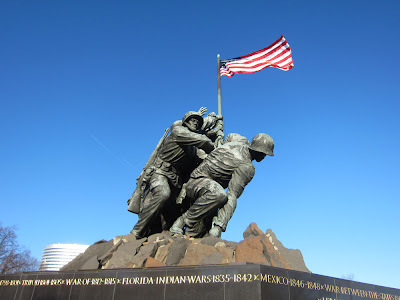 Amid increasing press coverage of Rosslyn, ARLnow reports that the 1949 film, Sands of Iwo Jima, will have a free, outdoor screening near the Iwo Jima memorial this Friday starting at 8pm. The film stars John Wayne. In addition, on Sunday from 11 to 3pm, park rangers at the Iwo Jima will be giving talks about little known secrets of the statute. The weekend events are coordinated with the Partners in Preservation voting for preservation funds. The Marine Corps Memorial is one of the candidates for funds. The Ode Street Tribune strongly endorses the Marine Corps Memorial's candidacy. We count five thousand nine hundred thirty-one combat ground casualties on Iwo Jima, consisting of marines, Navy guys, and one coast guardsman. They are all buried on Iwo or lost on the island. The remains of one hundred seventeen are still missing, meaning that they have been declared dead but their remains have not been recovered. A lot of them were lost in the sea where their boats were hit or shot as they tried to wade ashore. Others were incinerated by artillery explosions or blown to pieces. Report of Patrick Mooney, USMC, assigned to record burials on Iwo Jima in 1945. Be grateful for the sweet and easy life we have here in Rosslyn.